Is your computer stressing you out? Don’t cry, just call the guy in the bow tie! When computers don’t work as they should, they make life more frustrating than it needs to be. I can de-stress your computing life by explaining what happened, or why (when possible), fixing the problem, and showing you what you can do to keep problems away. I will make your life easier by explaining everything I do in everyday English, with as little jargon as possible, so you know what’s happening. No question is too basic and you should not be made to feel stupid by a machine. 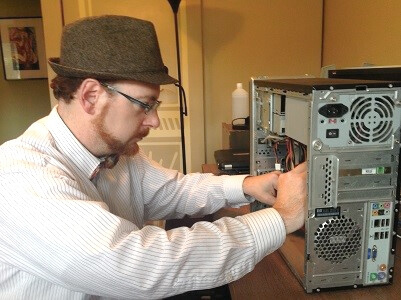 Whether it’s a virus, a Blue Screen of Death, a mysterious slowdown, or a laptop screen replacement, I do repairs on all types and brands of computers and laptops. An evaluation of your computers current setup can catch problems before they become big problems, potentially saving you money in repair costs and lost time. Peter’s PC offers a free 10-Minute Security Review to examine your computer’s protection software and make recommendations for improvement, if any are needed. Protecting your computer and data is an ongoing process. Hackers, virus writers and spammers are always trying to be one step ahead of your security measures. Simple security practices will help you keep the attackers at bay and prevent viruses and spyware from coming into your computer. I can show you how to do these things, in language you will understand. “My laptop had been conking out every few months and I had been taking it to a local repair shop who ultimately just reinstalled windows and cost me a week of lost work each time. The most recent time it happened, I called Peter who came to my house and had everything sorted out in a couple hours.